The start of Low Season is instigated when the first big winds appear in the Bengal Bay and stir up rain bearing clouds that sweep down and cover Thailand’s west coast. The Bougainvillea locally known as Fon Fa, which have bloomed in huge pink flowers, are over night, torn from the bushes as large raindrops tear through their fragile foliage. Rain also is key to the survival of the Tourist hotels and resorts on the islands. Tourists consume a lot of fresh water and the ownership of the wells is an important and lucrative business. Some of the smaller resorts have water problems from January to April. 90% of the island is mountainous or karsts cliffs. This allows the heavy rain fall to soak into the ground. Since nowhere on Koh Phi Phi is far from sea the well water is partly saline especially from February to April. 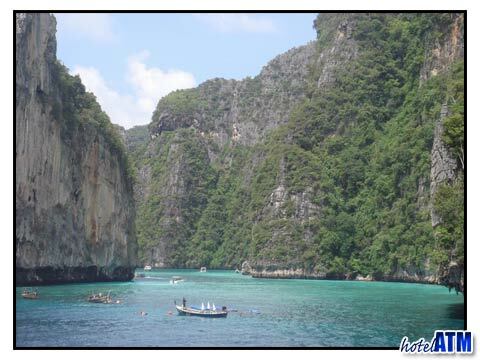 Rain in low season can effect the sea temperature on Phi Phi next to land as cool outflow mixes with the warmth of the sea.